Like his countryman and contemporary Benjamin Franklin, Benjamin Thompson (later Count Rumford) aimed by his inventions and scientific research to increase the degree of comfort in daily life. During fourteen years spent in Munich, he made important reforms in the city's public service and social welfare institutions; he also introduced improvements in the hospitals and workhouses in Ireland, England, and Italy. His goals were practical, and his contributions to our knowledge of the nature of heat were as valuable as Franklin's to our knowledge of electricity. Rumford believed heat to be a form of energy, and worked to demolish the widely held material theory of heat. 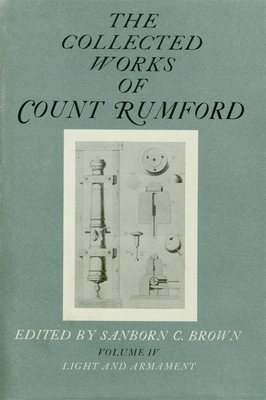 Between 1870 and 1875 the American Academy of Arts and Sciences in Boston published Rumford's "complete" Works, financing the project with part of the increase of a fund that Rumford himself had given to the Academy in 1796. This edition presented, in order of their first appearance, all the papers that the Academy committee was able to find. The Academy edition has long been out of print and practically unavailable. In this edition Sanborn Brown has rearranged the papers according to subject matter. Rumford's papers dealing with light and with armament are contained in this fourth volume. They include "Intensity of Light"; "Coloured Shadows"; "Harmony of Colors"; "Chemical Properties of Light"; "Management of Light"; "Source of Light in Combustion"; "Air from Water Exposed to Light"; "Description of a New Lamp"; "Experiments upon Gunpowder"; "Force of Fired Gunpowder"; and "Experiments with Cannon."